Love this down alternative duvet insert. Highly recommend. It is high quality and worth spending the extra money. Very soft and size was perfect for my queen bed. 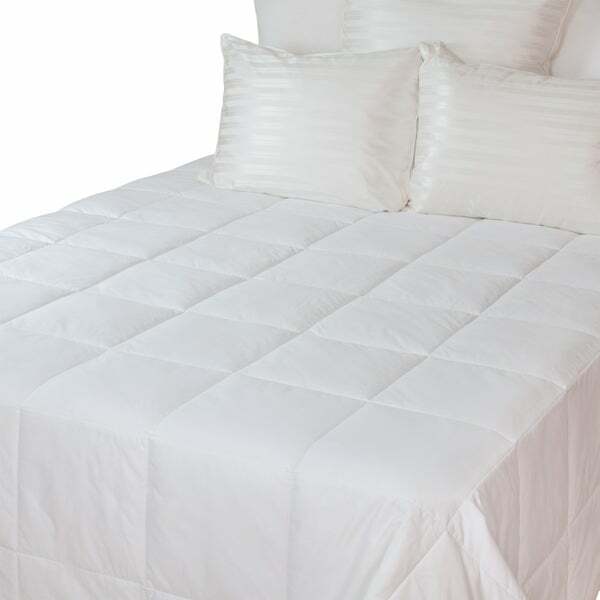 Set a cozy and relaxing tone to your bedroom setting with this down alternative duvet insert comforter from the DuPont collection by Austin Horn Classics. The cover features a box-stitch cotton sateen construction for style and comfort, while the 500 thread count offers long-lasting durability. Stay warm on cold nights thanks to its medium-weight warmth rating. Small carbon footprint in comparison to other polyester down alternative fiber. Very comfortable and excellent quality. light weight and happy that it is non-allergenic. good echo friendly. Very happy. thank you overstock for bringing this product. I'm looking for something fluffy. This had less fluff than the 10 yr old duvet that we are trying to replace. the size worked with the duvet cover. The dimensions fit the duvet cover I already have. The others didn't. Also, I wanted a down alternative insert. Actually because of a negative review which said the insert was flat as I do not want a thick comforter. Thick does not necessarily mean it is warmer.